Love Raw: What to do a gloomy day..
What to do a gloomy day.. This is what it looked outside my window when I woke up this morning... Gaaah... Even though I have my hands full of upgrading our webshop (making it available for international customers too), I do have a list of things that will brighten up a day like this! • Take care of your morning! Charge your day with positive energy by letting the hours in the morning be the most important to you. How can you fill yourself with a high-on-life-vibe? Do you need to give yourself a really slow morning, reading the newspaper, or go out for a brisk walk? • Put your favorite music on. I love Frank Sinatra, Louis Armstrong, David Gray, Daniel Lemma, Priscilla Ahn (try the 'A Good Day' album) and as you know John Mayer. People with great voices, classy, intimate and warm. If you're into guitar music, Jon Gomm is a must. - 1/4 cup oil (sunflower seed oil, sesame oil, olive oil, jojoba oil, avocado oil etc) depends on the level of luxtury you want. Sunflowerseed oil is the budget choice, and jojoba oil the best quality oil for your skin. - Add 10 drops of Lavender oil into it all and stir. - Put in a glass jar with a lid and keep it close to where you shower. Use once a week. If you have sensitive skin: Use sesame oil that calms the skin. I love to use it on my feet and hands too. After the scrub, apply some virgin coconut oil in your face as a balm and then put your day cream on top. I use Weleda Skin food and organic surge's products (first class face mask is great). • Write a thank you-letter by hand to someone you care about. • Take the time to get engaged! Check out Avaaz.com, larouchepac.com, naturalnews.com, abundanthope.net and halfpasthuman.com to get the type of insider information the news will never give you..
• Watch Miyazaki-movies! The latest one is "The borrower Arrietty" from 2010. Though, you have to watch them in Japanese, English just won't do! 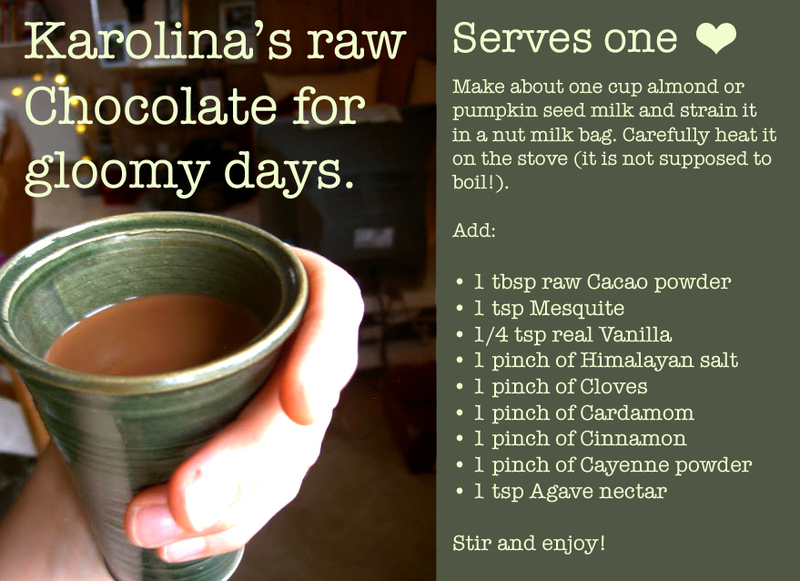 • Make raw hot chocolate with mesquite, raw cacao, agave, some cinnamon, a pinch of cloves and chili. Enjoy it while thinking about things you are grateful of having in your life. • If you don't write a journal, why not start now? And when you are at it, why not make a Creative Journal! Check out this gifted woman and her amazing program. • If you're a woman: put on a bright red lipstick. This is a killer trick to quickly sassify your day! Especially for those of you that instinctively avoid bright red lips (or lipstick at all). Try it out! Maybe you didn't know you had a burlesque hottie inside of you. You will definitely get appreciative glances from both men and women. The great thing about bright red lips, is that it fits you weather you are a brunette, blond or redhead. • If you're a man: try shaving with a real shaving knife, shaving balm and a leather strop for proper maintenance. Here's some tips from the master barbers. • Walk around all day wearing nothing else but a red nightgown (one that fits you Perfect), a pair of cozy legwarmers and a knitted cardigan. Stay in bed reading and sipping tea. • Put time and love into making yourself a fine meal with starters, main course and dessert. Set the table as nicely as you can. Candles and music is a must. • Read haikus. Reading haiku poems is a great way to slow down. Haiku is the Japanese art in communicating short and precise, using only three phrases, to describe a scene from nature. • Find your favorite quote and frame it. • Join your local transition movement, or urban farming movement or become a guerreilla gardener! • Dance! Put on some silly music and hit it! • Send some love to a hospitalized person with these healing boxes! 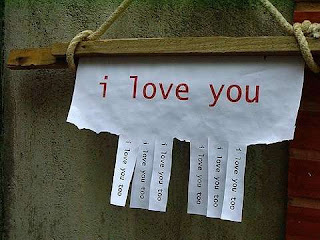 • Spread some love by pasting lovely notes on walls and on lamp posts in your city. You will feel like the Hero of the Day. • Go to a beauty shop and smell perfumes for at least 30 minutes. Find your every-day-scent, and your bold-diva/macho scent. I'm in love with this one..
• Turn a second hand item into a piece of art by adding color, beads, cutting shapes, or using a specific detail of it and give it away. This is a great exercise for your right brain and to see the potential greatness in things! Check out me and Jakob's lamp we crafted here. • Get a nice flower with a lovely fragrance! The scent will fill your room with an alive aroma that will lift your mood in zero time. I have one of these jasmines by my computer. • But... why dread a gloomy day? There's nothing that brings out your inner child the way snowflakes can. oops shot* of the snow! Ohhh, Karolina! What a fabulous post!! And the snow is wonderful!! (From the inside looking out :) Look how great you write in English now!!! I'm so proud of you and love, love, love your blog and eBooks!!!! Kat: Hi! Yes the shop will be open for customers within EU as well as non-Eu countries. I had a look at your blog the other day, it's gorgeous!! Best of luck with it! I love this post!! I am so glad to have discovered your blog. Beautiful picures. Thank you Noelle! And welcome here! !